- Write a starting post that states which level you will be working toward, including a link back to this post. You can include a list of books, but it is not required. Link to your post in the Linky below. - If you don't have a blog, leave your information in the comments on this post. - Reviews are not required, but I will have a post set up where you can link up to your reviews throughout the year. - A wrap-up post at the end of the year will be required to be considered for the final giveaway. If you don't have a blog, you'll need to comment on the wrap-up post with your accomplishments. - You can sign up for this challenge through November 30, 2012. I love this, I read a lot of non-fiction and I love to learn new things, so this is perfect for me. I'm looking forward to see what other people will be reading. For some reason the html for your button didn't work for me. I had to change the url for the image, and I had to retype the quotation marks, for some obscure reason. @akika - Thanks for letting me know. I think I've fixed it. If anyone else has issues with it, let me know! @Jedediah - I hope you enjoy the challenge! I'm in! I like the idea of this challenge a lot. I think I'll start small, with the 5-book commitment. But with my groaning TBR shelves, I may reconsider. You'll have to take this as my sign up because I don't have time to do an official post until this weekend. @got2care - Welcome to the challenge! Be sure to link up a blog post when you're ready. @Sue - I hope you decide to join. That's why I decided to keep memoirs out of it. I wanted it to be a real challenge!! @Rose City Reader - Sorry for the confusion but you can actually sign up through NEXT Nov 30th (2012). So there's no rush! I'm glad you've decided to join! I've been making a list and think now that I may sign up for the 10-books level. One question -- do collections of essays count? I know you said "no essays or articles" but does that mean individual essays or articles, or also collected editions published as books? Your challenge, your rules, but I just thought I'd clarify. I see a lot of essay collections on my TBR shelf. I'd say collections of essays are fine as long as it's counted as one book. The main reason I said no essays and articles is because I didn't think it would be fair to read a short essay and consider it the same as a full-size book. I concur! Singles articles would be a little skimpy. But this means that I can add a couple of books to my list that I have been meaning to get to for quite a while. This sounds really cool. Since I tend to read mostly nonfiction, I think I might have to take part in this challenge ! I was going to join this but all the nonfiction books you aren't allowed to use are the kind I read. I'm disappointed. @maphead - I hope you join in! @Julie - sorry about that. If you like reading memoirs, I'm sure there's another challenge out there for reading those. 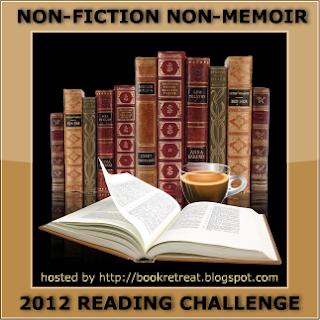 Discovered your challenge and blog via the Novel Challenges website - sounds like a good challenge for me for 2012. I'm feeling a bit dense so will go ahead and ask - I understand no memoirs/auto-biographies but biographies are accepted right? (Blushing and going in search of yet more coffee...) I just re-read your post and I see that yes, biographies are fine. I believe I will be joining and once I have my post up I will do the linky thing. Hi, I'd love to join this challenge but am confused about the term 'reference books'. I was planning to read books on Greek literature and history for this challenge. But would these count as Reference Books? Love the idea of your challenge and have signed up! Already have my first 2 books ready! OK, I added my link. I signed up for the Diploma level to read 10 books, but there are more like 20 on my list of possibilities. I'd like to join at the Elementary level please. Will link up when I get a post done, thank you. I'll do the diploma in 2012 and progress from there! Thanks for hosting. Happy New Year. I am new to blogging, so please forgive any missteps, broken links, or other Newbie idiocy. I'm a little confused about what is allowed on this challenge. Travel books are allowed, but memoirs are not. So that means books like "Eat Pray Love" and "Under the Tuscan Sun" are out, but "Dummies Guide to Disney World" is ok? I guess I am trying to understand what a travel book might be that is not also a memoir. Thanks for any clarification. I'm just preparing my reading list for the challenge and wonder if Thoreau's Walden is a memoir? Oh this is hard i like it! i read a good percentage of non-fiction but most of them are memoirs so this is very challenging. Since I read mostly nonfiction, this is MY KIND of challenge !! I am in. I'm going for the 10 books. I'm in! I need a little help to get me reading the nonfiction on my shelves. So here goes! I'll try the Diploma level. My reviews will be on Shelfari and I'll provide a link to them in the post for reviews. I'm going for 10 non-fiction, non-memoir books this year! I am in for 10! sounds fun. I'm signing up at the Diploma level. Looking forward to it, since I need to read more non-fiction, but just never seem to branch out enough. I had planned to try to read more non-fiction this year anyway so this is perfect!